Rose, whose latest effort is the Oink app that lets people rate things, pointed out in an earlier tweet that the McDonald's deal contradicts LivingSocial's mission of "pursuing both the things that define a place and the undiscovered jewels." He told entrepreneur Brenden Mulligan, who'd tweeted that a deal for one McD's meal would have been okay, "it's just sad given that there are a ton of 'local' burger shops using quality meat they could have promoted." Votizen co-founder Jason Putorti tweeted a question that's on our minds, too: "Was that #brandkill from @livingsocial this morning? Or was it just to get us talking? #discuss." LivingSocial reports having more than 34M members in the United States and 46M globally. The number of vouchers bought worldwide is 22M -- meaning over 10% have been for Amazon and Whole Foods depending on when LivingSocial last updated its stats. 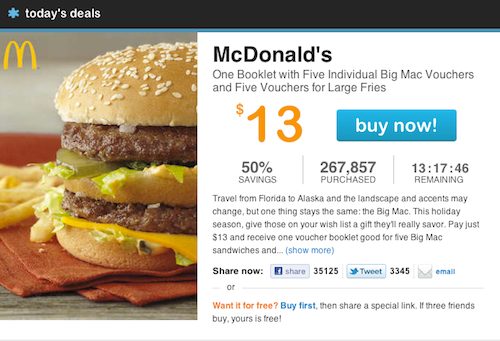 Groupon has yet to offer a deal with a national fast food chain. The closest we found was a deal for Chick-fil-A in Orange County, CA, in September ($8 for up to $17 value), which sold over 5K. Groupon's best-selling fast food deal was in Hong Kong, where Triple O's sold 70K burgers in 72 hours in January. 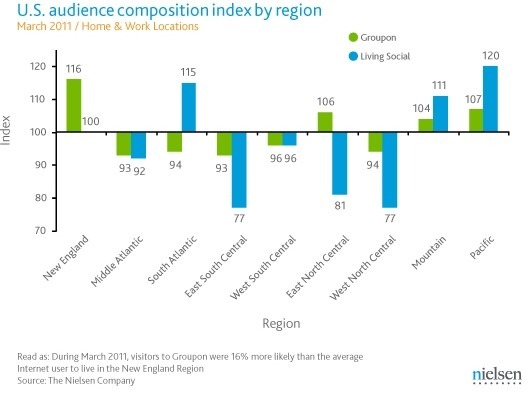 LivingSocial users are in the Pacific and South Atlantic regions.